Induction sessions are required before using our screen printing facilities in order to learn in detail the systems we use. This has been found to help with the smooth running of a shared work space. There is a small fee for this (for rates please enquire). The price is £14 per session (£42 per batch of three or £80 per batch of six). 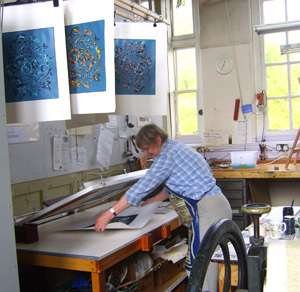 Booking: the screen printing facilities are managed by Kew Studio’s Print Room Technician, Peg Morris. PLEASE NOTE THAT THE PRINT ROOM CAN ACCOMMODATE ONLY TWO ETCHERS OR ONE SCREEN PRINTER AT ANY GIVEN TIME.